I refuse to believe that anybody alive who has seen a painting, sculpture or any similar type of work of art has not reacted either positively or negatively to it in some way. I do not mean that everyone is an art lover, heavens no, but that art does not draw some level of response from the beholder I find very difficult to accept. In my own case I am very lucky that I have travelled widely around the globe and seen many of the most beautiful paintings of all time. But which do I admire most in the sense that they have had the longest lasting, or made the strongest impression on me? Well given that I used to take visiting friends round the main galleries in Paris, London and Florence when I was at University you would probably expect me to be primarily a lover of Western Art. And then again a trip to the USA and their museums followed by my almost four years in the Far East could have touched a chord in me that reacted melifluously with Eastern art, but you would be wrong. Ever since I was about ten years old I was always fascinated by Byzantine inspired iconography and this reached its apotheosis when, in 1971, I spent a few days in Moscow and fell hopelessly under the spell of Andrei Rublev (c 1362 to 1429). Most art historians’ consider him to have been the greatest Russian Mediaeval painter. There are many, I included, who place him the greatest of all time. But why should such basically not fully developed artistic works move me so much compared to the many later masters of other genres? A simple, single word answer. Love. He portrayed it as few others have ever managed, and more consistently peacefully and spiritually than anyone else at all. 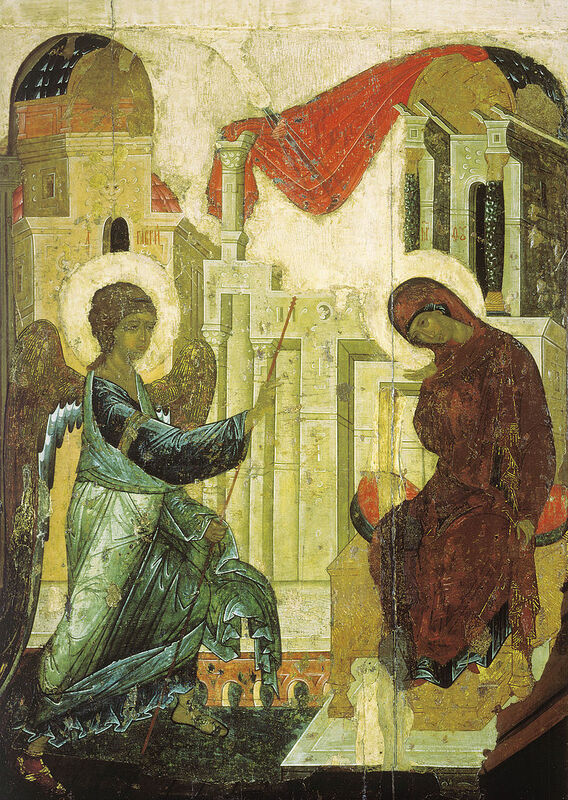 This is an example of his famous painting of the Holy Trinity, (see below) kept today in Moscow and through all Russia’s turbulent ages since it was painted around 1410, was always revered and guarded as a national treasure. It is the quiet, happy quality of the expressions of the mystery of God, his son and the Holy Spirit, happy and tranquil in their Trinity, that are literally a century earlier than any other school of art depicted anywhere. Now my univrsity studies, mediaeval history, iconography, hagiography and philosophy never had any bearing on my future career as a journalist. But as I said it did give me the opportunity to take friends and relatives round famous galleries where most of them drooled over Leonardo, or the impressionists or cubists, – though how you could drool while squinting I cannot imagine – . Yet I always found myself going back to my early roots and to Byzantium and its following centuries of influence over Eastern European art for nearly a thousand years. I found myself lost in the universal good sense of the artist in realising, and managing to portray at the same time, the quality that is most important in spiritual love. His portraits show that anyone can love and forgive anyone else if they keep their feelings and emotions of revenge, anger and violence under total control when separating the person, the sinner if you like, from the the evil deeds they may have committed. 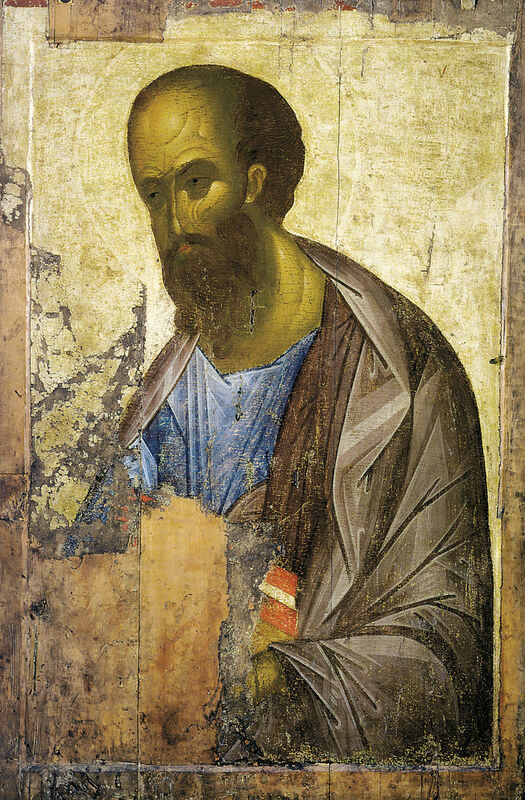 Look at Rublev’s portrait of saint Paul, (below), that hangs in a Moscow gallery. Who else has ever depicted the writer of so many important letters on how men should live and behave to please others, and ultimately God, without a suggestion of censure in the face? And even more clever, note the way the majority of the head is bald, suggesting a wisdom beyond the ordinary. Few, if any, painters have captured those dual aspects of the author of so many early epistles. But my favourite painting (below) of Rublev’s, which Mocow at the hight of the cold war also blessed me with, was Rublev’s beautiful picture of the Angel Gabriel telling the Virgin Mary reassuringly, “Don’t worry my dear. There’s nothing wrong. God has done something wonderful for you, you are to have his son.” And as Gabriel smiles, so we can just see the light of an uncertain joy starting to form on the face of our Lady. You may not believe the Christmas story, but if, like me, you do, then that work of art sums up the most beautiful moment in our history more perfectly than anything else I have ever seen. I may be a Catholic but I am so glad the Orthodox church canonised Rublev in 1988. So all I have left to say to all of you, whatever you believe or like looking at, is have a very Happy Christmas, for that is what Andrei Rublev would have wanted you to have. So much skill was required in those days. The artist had to not only be able to produce the image in the way he wished, but also to possess enough knowledge to make his own paints. 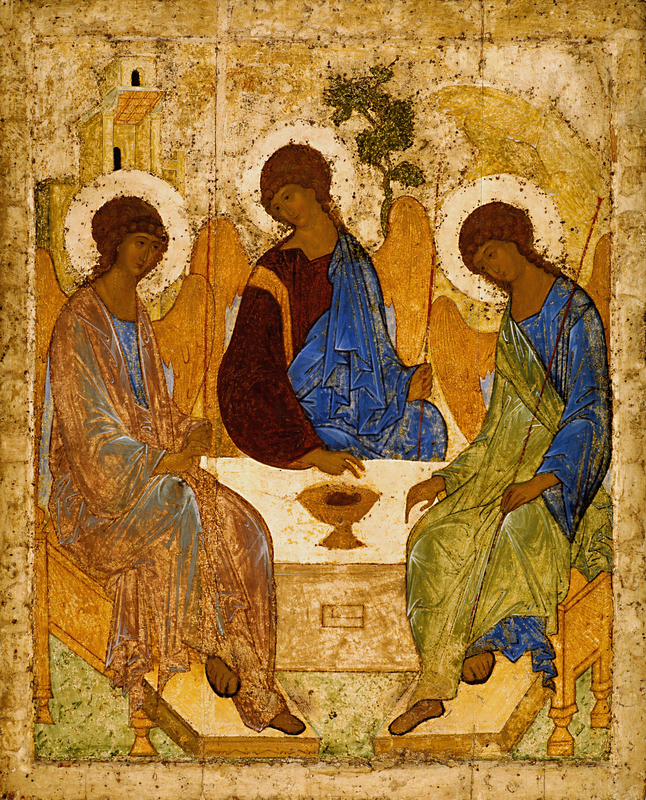 All of the colours in these paintings are beautiful, but the blue in Rublev’s Holy Trinity is incredible. Although I grew up in an an artistic and creative atmosphere, I am ignorant about Medieval art. This post has whetted my apetite. As for traditional Chinese (and Japanese) art it doesn’t appeal to me. There are too many constraints. I think the only constraints an artist should have are moral ones, and those which he places on himself. All lovely. Merry Christmas to you, Anton.